I’m taking a buddies’ advice and massively jumping my own queue to talk about a sort of gear system that I’ve been building up over the past few months. One which is pretty much pivotal to the end goal I’ve really been looking for for at least 4 or more years now. In the past I’ve always posted kit in chronological order of purchase, but that tends to mean any given notion I’ve adopted will have become much more popular in general after the 18-24 month delay I’m currently working through. Now, it’s nigh-on impossible to talk about this sort of thing without sounding astoundingly arrogant, but honestly at this point there’s almost nobody else that I look to when it comes to trying to formulate the all around best, most efficient load-carrying configurations available using quality nylon goods; aside from the manufacturers themselves (the ones that are innovating anyway). I look at the equipment I want to carry, decide on the ‘best’ pouches to carry it in then on the ‘best’ platform to mount those pouches to. Many years ago while starting out in airsoft before I joined the raf I would spend hours upon hours scrolling gear threads on forums to try and find the most optimal configurations that had already been dreamt up by people more experienced, knowledgeable and imaginative than myself, but truth be told I’ve mostly reached a point where looking at what other people do is no longer bearing of fruit; at least within the very specific niches for which I use this stuff. I still look around and certainly do not think I know everything because I don’t, but what I do know quite well is the best solution(s) for myself. I have tried out and played around with more types of pouches and rigs than I can really remember now and granted sometimes I do occasionally experiment with some new configuration that turns out to be unwieldy, but after so many years of trying and failing I have to say I’ve gotten fairly good at knowing what will comfortably work and what won’t before ever actually using it. The ratio of successful attempts to failures is in a good place all things considered. 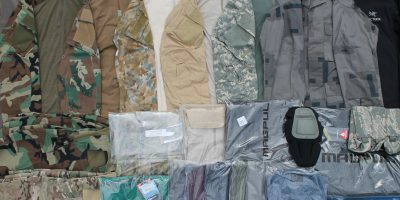 An idea I had begun to adopt a fair few years ago was the integration of modular placards in to 500D kit, because I was ending up with so many different PCs and chest rigs threaded with different size pouches just to facilitate various magazine styles that it had become prohibitive just in terms of storage space, let alone expenditure. I’m also pretty OCD about wanting to be able to use any given type of magazine with any given gear colourway and that’s just not a realistically achievable end state without using placards, not unless you have gargantuan amounts of money and storage capacity. Then, only a matter of months ago, I had what I’d class as a pretty sharp-turn sort of moment. I’m hesitant to say lightbulb since that implies I was blazing a hitherto unexplored trail and I’m never the first person on the planet to come up with a good new idea, far from it, but it was a lightbulb just in terms of my own personal outlook and future planning. I looked at my ever growing collection of placards, looked at the Spiritus Systems Mk3 Chassis, looked back at the placards then thought “You know? I can do this in a much more efficient way”. Now when I say *I*, what I’m really meaning is I’d make use of the core concept that the folks at Spritus have crafted with their Chassis in order to form the centre point of a larger structure, one that facilitates any popular magazine type being quickly mounted to whichever style of rig one might lend their fancy to on a given occasion. So far, having played around with the depicted gear a little bit, I think I’m fairly firmly on the right track as far as achieving the stated goal. When you look at the attached image, you can build the desired loadout by working from the top down if you like, but l will generally do things the other way around. First, decide on the weapon type you’ll be using and by extension the extra magazines you’ll be carrying. When we’re discussing the Spiritus chassis and D3CR-M then secondaries and other equipment may come in to play given the presence of the front pouch, but if you’re using a single cell placard (which Ferro offer in their ecosystem) then most likely it’ll just be a case of 2 to 4 box magazines. Next, you securely mount the appropriate insert for said magazines within the ‘core’ component, the keystone of the whole system. The more inserts you own, the more flexibility you have and not only are inserts cheaper and smaller than complete placards dedicated to one mag type, but they can of course also be moved around in to differently coloured/patterned nylon equipment. Finally, pick your mounting platform, clip in your two 1″ buckles and slap down the velcro at the back. In the depicted example I’ve used what I initially purchased to begin building this system. 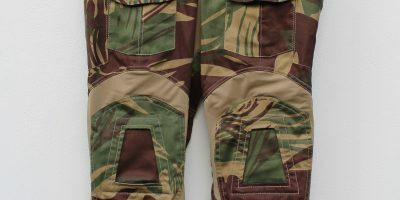 Multicam being generally the most proliferant material choice for anything tactical, I started there. The inserts shown are the Spiritus elastic types for 556 NATO mags, modern double feed plastic 9mm mags (eg Scorpion and MPX) as well as classic metal 9mm mags (eg MP5 and Glock). If you use the slightly larger D3CR-M in place of the Spiritus Mk3, you’ll be able to use the Haley Strategic Partners inserts as well of course to include their MP2s and if you sew some hook back to back you should be good to use Ferro inserts as well; though I’ve not tested that out for myself just yet. The pictured centre piece is the Spiritus chassis which happens to be fitted with a Bergspitze Customs zip for the front pouch and 1″ compression straps of my own design and manufacture. 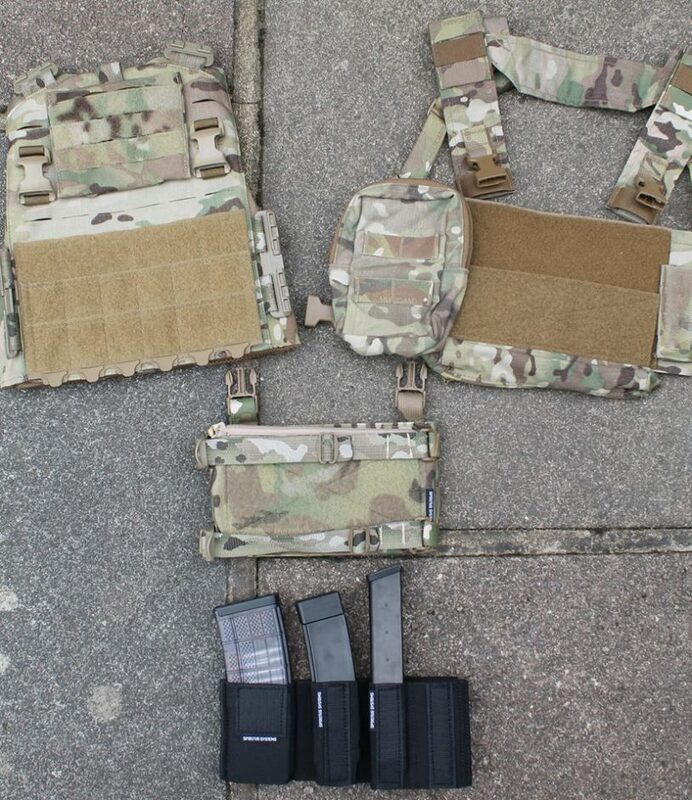 The Mk3 Chassis gives the greatest amount of modularity currently available on the market since it features 2 fully loop lined pouches versus the single one on the D3CR-M. Ferro offers a single cell modular placard (no front pouch) but their top mounted webbing is longer than the industry standard and won’t sit properly on most relevant plate carriers, as mentioned they also line the inside of one surface with hook instead of loop. Ferro also use G-Hooks, but the webbing is still 1″ so that can easily be changed if you’re able to modify around the other discrepancies. Edgar Sherman Design is planning on making something which can be pretty much thought of as a single cell Mk3, but that is an undetermined amount of time off in the future. Personally I’m exploring the single cell modular placard by having something custom made right now and I think it’s going to be a pretty damn good solution if I say so myself. The flexibility to move between PC and chest rig with the same load of magazines is, for me, a great luxury. The PC option here is represented by the front panel from an MBAV cut FirstSpear Strandhogg, with a loop field from Dead Coyote Tac and 1″ female QASMs with webbing backers from J-Tac Custom Limited. I mildly frankenstein’d the chest rig platform next to it by using the Ferro chesty wide (following a Reptile House review & recommendation) with Spiritus fat straps taking the place of the included Ferro H-Harness, enabling any PALS pouches to be added to the sides and any hanging GP bag of your choice to be dropped in to the mix. There are of course lots of other cross compatibility options available like the HSP X-Harness or Flatpack, you can also use the Spiritus wings in place of the chesty wide and the same chest rig base will also easily mount Vel Sys and ESSTAC placards… the list goes on. To boil it down, if you have the right gear (which may take a little while to assemble admittedly) you can pick almost any weapon type and be comfortably accommodated within either of the 2 most popular types of modern load carriage options. A belt line won’t really fit in to this placard system of course and you can maybe go with RTi mounted pouches to have speedy modularity in that arena, but right now I don’t have the perfect answer – the Raptor Tac version 4 belt may get there in future but we’ll see. A Vel Sys type PALS placard with TACOs was my previous entry in this context and it did do pretty well in terms of the fact it did support 556, x39 and 762 NATO mags, but then you’d need a different setup for many SMGs; particularly if you want to keep everything as neat and concisely mounted as possible. Not to mention of course the flaps and zips that can be added to the Mk3 and D3CR-M which allow for carrying of absolutely anything your magical little mind can conjure up. I’m investing a fair bit right now in to extending the notion seen in the image across all the major colourways I want to have in my collection and that is costing a pretty penny, but if this flexibility is something you’d like in your gear locker it doesn’t necessarily have to make the wallet wince if you just focus on one pattern or colour. Does it apply to most military personnel? 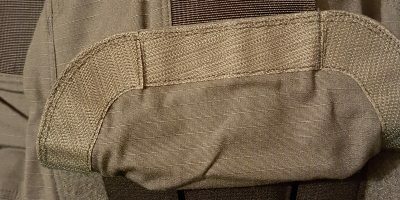 Not really, it would be frankly useless on my personal work gear because all I ever need is old school 556 pouches woven on to my armour and that’ll never change. SOF perhaps, when a person might find themselves switching between a 556 carbine, 308 rifle and maybe an SMG under very specific circumstances; often wearing overt armour but perhaps sometimes going for a smaller rig when reconnaissance or concealment are the order of the day. Certainly the principle is applicable for the civilian shooter and airsoft or paintball player where the options for weaponry are almost limitless and no authority from above is dictating load carriage choice. As always, have a think for yourself, decide your priorities and check out every option you can before hitting Checkout.